It’s never too early to get your kids to learn about STEM or Science, Technology, Engineering and Math. This is especially true for older kids who dream of being engineers, astronauts or scientists someday. The good news is that the ease by which high-tech gadgets can be used even by kids these days has turned them into cool toys which can double up as learning aids. Take the iPad as an example. Since Apple first released it, almost a quarter million useful and fun applications have already been created by developers. If you want your child to know more about science, math or any other subject, you can download nifty iPad apps and use them as a learning tool. 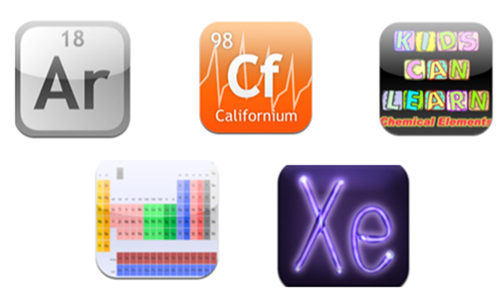 Here are a few iPad apps to learn the periodic table. If you see your son getting good grades in Science, then he should definitely learn more about the periodic table. For girls who are not that interested in the elements, maybe seeing the periodic table on a really interesting gadget like the iPad will get them hooked on learning it. To get your kids started on learning more about the elements, here are some iPad apps to learn the periodic table, which are a must-download on your iPad. Developed by: Mochi Development, Inc.
Bring out your kid’s inner science geek – in a good way – by downloading the EleMints: Periodic table application. Compatible with the iPhone 5, this app gives kids access to a revolutionary periodic table which has attention-grabbing graphics. One of the main functionalities of the app is that the periodic table can be shaded based on the property of the elements, although it has plenty of other features as well. Kids can use the molar mass calculator, the plot graph and the Chemical Equation Balancer – making it easy for them to play Mad/Brilliant Scientist! Which elements belong to the non-metals category? How about halogens, nobel gases, alkali and transition metals? By downloading the Kids Can Learn Chemical Elements, kids can learn about all these and more. The software showcases the 118 chemical elements which include the newest discoveries. If parents want to participate in their kids’ quest for more knowledge about science, they can make use of the scoring feature which can be turned on or off. If you want an app which features just the basic periodic table of elements without all the bells and whistles, download Periodic Table of the Elements developed by Kevin Neeland. What makes it different from the standard periodic table is that the elements are not crammed into one tight chart. Instead, you can choose a particular chemical attribute then the entire chart will be color-coded based on your selected trait. Kids can choose elements according to atomic number, electronegativity, chemical family, boiling/melting point or state – whether it’s solid, liquid or gas. The Element: A Visual Exploration prides itself in the fact that it is the first e-book developed from the ground up for the iPad. Suitable for older kids or even teenagers and adults who have a natural love for science, this app is a truly interactive one. The ‘living’ periodic table can be tapped so that you can learn more about each individual element. There are columns for facts and figures regarding the element that you’re studying, and there are even stereo 3D images included. Finally, The Chemical Touch is an app which lets kids learn more about the properties of elements. You can recolor the table to learn more about periodic trends. The Internet button opens a Wikipedia page for the element chosen, and the basic properties of the elements are also showcased. No matter which of these iPad apps to learn the periodic table you end up downloading, your little scientist is bound to have fun learning more about the elements with the help of an interactive periodic table.